Listing courtesy of Avi Barazani (CalBRE #01004601), Coldwell Banker Residential Br. 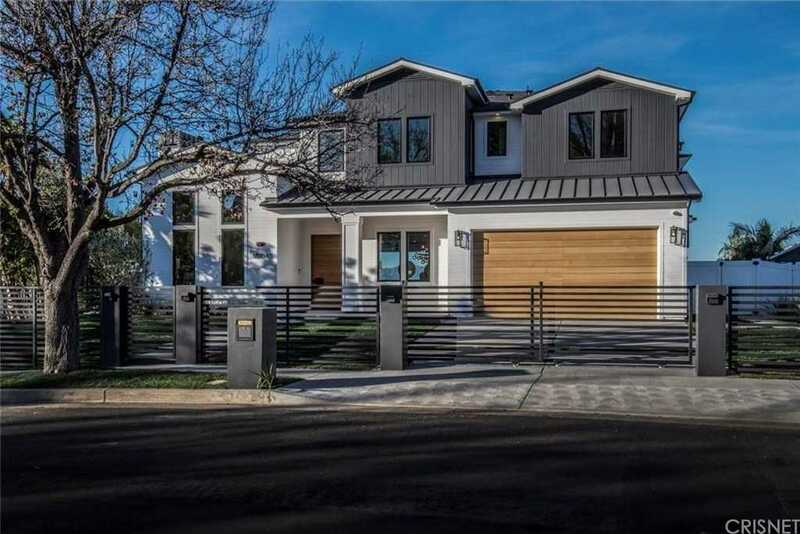 Gorgeous new transitional home with modern touches in Lake Encino area, with stunning views of the Valley and mountains. Main home featuring 5BR-5.5BA, family room with fireplace, dining room, and media room with projector/screen in an open floor plan of approx. 5,141 sq. ft and approx. 225 sq. ft. cabana with three quarter bath. Gourmet kitchen features custom cabinetry, stainless-steel appliances, island with sink and built in breakfast area, walk-in pantry, and custom wine display. Kitchen opens to bright family room with built-ins, fireplace, and sliding glass pocket doors to covered patio. Entertainer?s backyard features cabana with three-quarter bath, BBQ area with bar seating, contemporary zero edge pool/spa, and panoramic views of the San Fernando Valley reaching back to mountain range. Master suite features pitched ceiling with beam design, fireplace, balcony with stunning views, large master bath with two vanities, views from tub, and two walk-in closets. Home is completed by entertainer/designer details such as high ceilings, engineered hardwood floors, custom woodwork and beamwork, media lounge room, Control 4 smart system, and security system with alarm/cameras. Building size: 5366 sq ft. Please, send me more information on this property: MLS# SR19020296 – $3,895,000 – 18041 Green Meadow Drive, Encino, CA 91316. I would like to schedule a showing appointment for this property: MLS# SR19020296 – $3,895,000 – 18041 Green Meadow Drive, Encino, CA 91316.